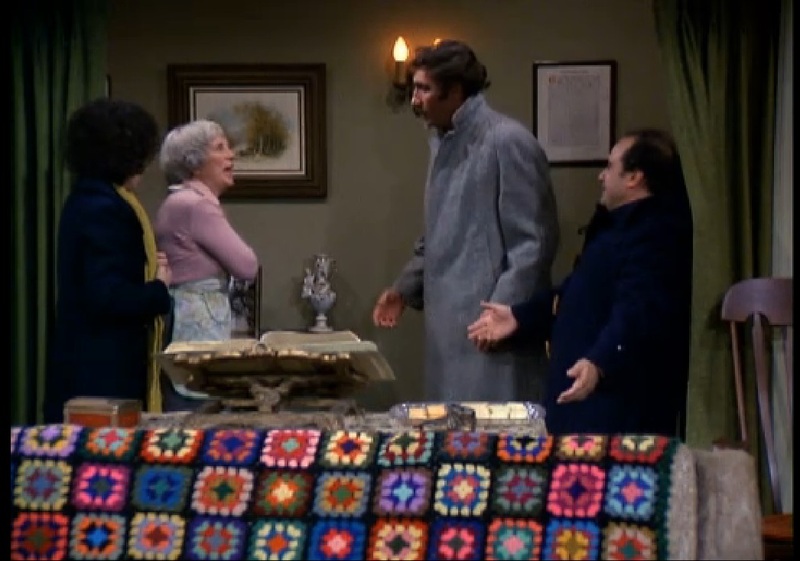 This totally retro 1970’s colour scheme granny square blanket can be seen in Season 8, Episode 6 of It’s Always Sunny In Philadelphia. Thank you Cade for sending me the screenshot! Just like The Roseanne Show couch blanket and the blanket on Amy’s couch on The Big Bang Theory, this is a traditional granny square blanket. All the squares are the same, made up of a light yellow, dark orange, lime green, light orange and finally a brown round. I would guess the blanket is the same size as the blanket in Taxi – roughly 9 rows of 14 squares. As for the pattern, visit my Photo Tutorials tab for instructions on how to crochet a multi colour granny square. Don’t you just love granny square blankets? 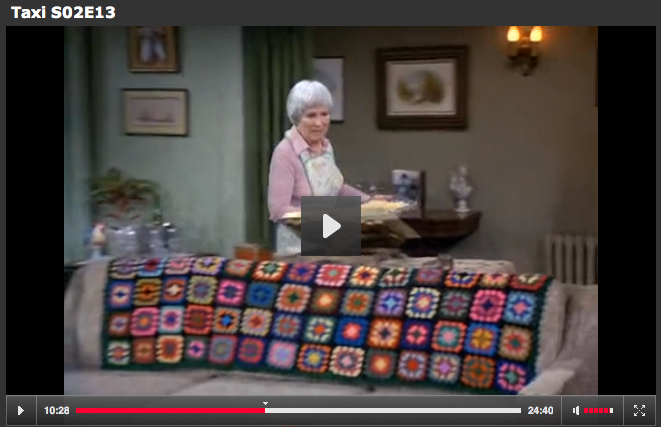 Even the TV shows know that a granny square blanket can make any house a home, no matter what the colour scheme. 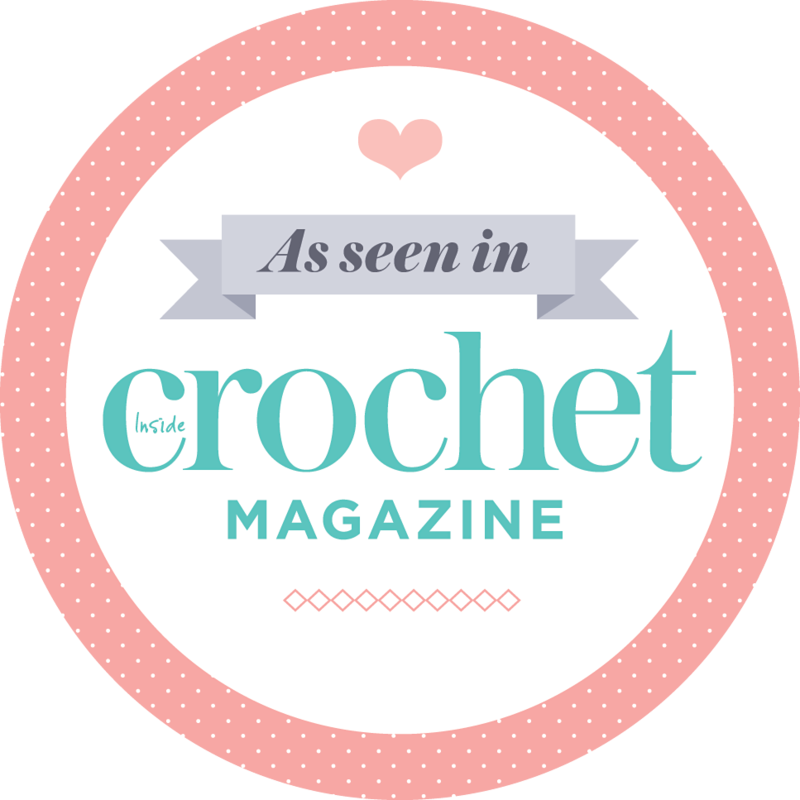 It’s been a while since I’ve seen crochet on TV, but luckily you fabulous blog readers email me when you spot something for me to investigate. This time it was Joanna who asked me whether I’ve seen the Blue Blanket On The Couch in Gilmore Girls. She desperately wants the same blanket for her home. Joanna said that she blanket appeared in Season 5. I watched the whole season but couldn’t see a crochet blanket anywhere. Eager to help her out and to see what the fuss is about, I did a few searches in Google Images and found photos of two crochet blankets! 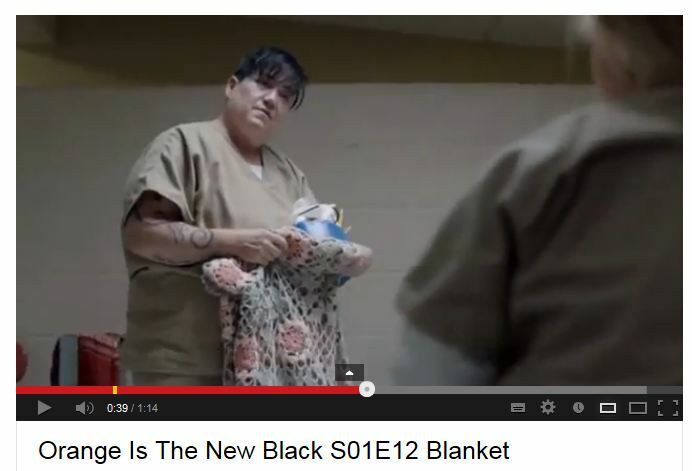 One appears in Season 7, and the other is the blue blanket that Joanna emailed me about. Whoo-hoo! I think the Chinese Rose In Square pattern by LubaDaviesAtelier could easily be used to create a throw like this. In stead of one round of yellow like in Luba’s photo for her Etsy listing, make at least three rounds in white. When you join the squares together you will have 6 rows of white between each rose, which should give you an effect like the Gilmore Girls Red Roses throw. Now for the Blue Blanket On The Couch that kicked off my Gilmore Girls crochet scout. I can see why Joanna would want to make this blanket. It’s such a pretty throw with a vintage feel to it. To replicate it, I think the High Noon Square from the book 50 Fabulous Crochet Squares is the one to go for. Use the pattern, but do it in a duck egg blue shade. For the wide ruffle border, I suggest Border 45 from Edie Eckman’s Around the Corner Crochet Borders book. You would have to repeat the first few rows a few times (the rows before doing the scallop edging) to get it to be as wide as the Gilmore Girls blanket. So that’s it. The two crochet blankets in Gilmore Girls located, dissected and ready for you to replicate! In August 2013 Kyli Rhynalds contacted me with a plea for help. She had seen a crocheted blanket on Episode 12 of Orange Is The New Black. She emailed to say “I HAVE to recreate! I’m sure you understand that need. 🙂 Do you think you can help?” Of course I understand. The blanket is absolutely beautiful! I seriously had gooseflesh when I saw it. It looks so femine, lacy and soft. I can imagine that prison inmates would fight about this blanket. Hey, I’m a free womand and I’ll fight for it! I don’t have a lot of photos to go by, but between Kyli and me we figured out that two motifs from Pierrot Yarns can be combined to make a very similar blanket. For the yarn, stick to light grey and two shades of a peachy-pink in Chunky or Aran with an appropriate size crochet hook. For the grey octagons, I found Colour the Season Coasters, which is a charted Japanese pattern from Pierrot Yarns. 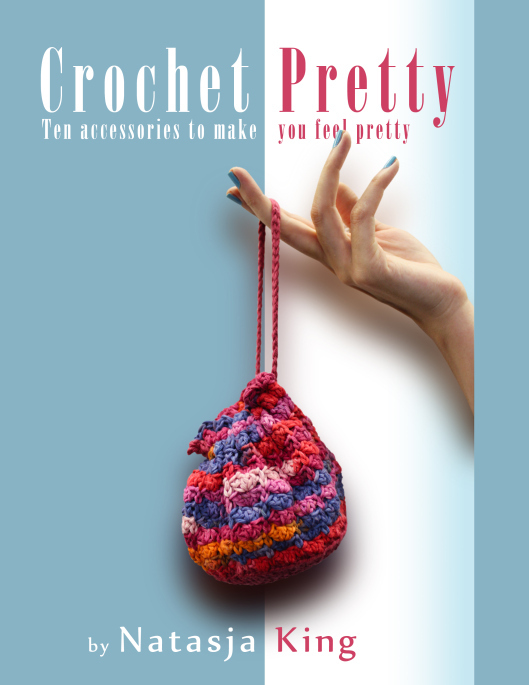 Click on the “direct link to pattern PDF” hyperlink in the Ravelry description to open a pdf file for the crochet chart. For the flowers I think this is the closest flower motif. It’s also a charted Japanese octagon pattern from Pierrot Yarns so it should fit it with the grey octagons. If you look at the first photo, you’ll see that the spaces between two motifs are filled with 5-chain links. These 5-chain links are used in the grey octagon motif, so just keep adding those 5-chain links around the edges of your motifs to make up the empty spaces and join the motifs together. In the second photo you will see how the blanket is edged. You basically have to fill in the spaces between the motifs around the edges, with more 5-chain links, and use (US) double crochet / (UK) treble crochet stitches to make the sides square. I think you would have to do like they did by making wide borders, otherwise your blanket may be too floppy. The wide border is what makes it keep its shape. This blog post is certainly not a pattern for the Orange Is The New Black blanket – you’ll have to play around a bit and figure it out as you go, but hopefully the two motifs I found can point you in the right direction. *If you need help with reading Japanese crochet charts, I list handy websites in the last paragraph of this post. 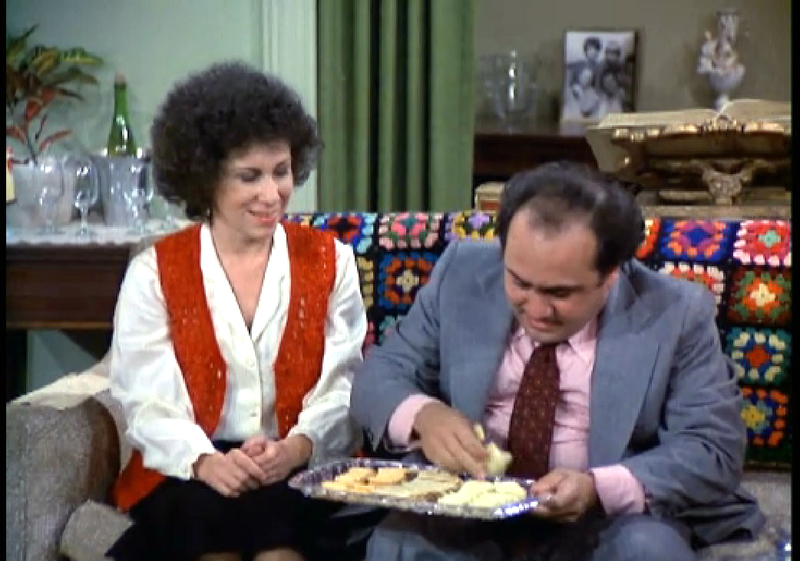 Yesterday I received an email from Cade J. Campbell of Cleburne, Texas alerting me to another Roseanne style granny square afghan on a TV show: the crochet afghan on Zena’s parents couch in Season 2 of Taxi, episode 13 Louie Meets the Folks. 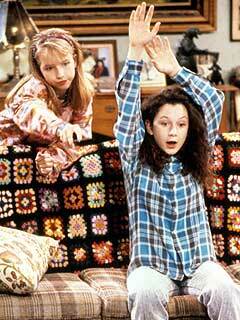 Most of this episode is set in the living room where the granny square afghan is thrown over the back of the couch. It really is a beautiful multi coloured granny square. It livens up the scenes with its bright mix of colours. I love it! I’m so glad Cade told me about it! Cade also very kindly sent me a couple of screenshot. Thanks Cade! To recreate this granny square afghan you would need 4-round traditional granny squares in a mix of bright colours. I think the square are arranged in 9 rows of 14 squares each, so that would be a total of 126 granny squares. The squares look quite big for 4-rounds granny squares, so I think they used a Chunky yarn. What makes this afghan different to, for instance, the Roseanne crochet afghan is the way the squares are joined. In the Roseanne blanket the black yarn was used as the last round of each square. From what I can see the black yarn in the Taxi afghan was only used to join the squares. I think they did a slip stitch through the chain 1 space of both squares, then chained 3 and did a slip stitch through the chain 1 space of both squares again and so on. Where four squares connect, the centre looks quite dark. This would happen when there is a slip stitch in each corner shell of the four squares – the four slip stitches, seen together, will make a tiny black square. The border for the afghan looks like a row of shells, done in dark green. You can have a look at the Photo Tutorials tab of this blog to download a pdf document that shows you step by step how to make a multicoloured granny square. Don’t you think it’s amazing what a difference the way you join granny squares, can make to the overall look of an afghan or blanket? The Roseanne and Taxi couch afghans are both done in traditional granny squares, both in bright colours arranged in no particular order and in both blankets the squares are framed in black – it’s just the amount of black that differs and yet the two blankets look totally different. And this is why I love granny squares – the possibilities are endless! Mabel is the spokesPug for Three‘s Pug321 campaign. 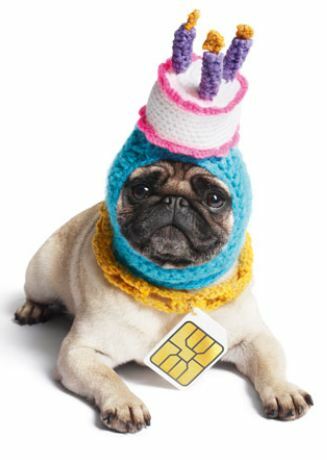 Only a pug can carrry off a crocheted birthday cake hat and gangster chain and still look this cute – choosing Mabel was perfect casting by Weiden & Kennedy London. Three says they used a pug for this campaign because “pugs are charming creatures that embody the spirit of the internet: serious, but with a just a little bit of silliness.” I think I’m going to start calling the internet, Mabel from now on. If you want to dress up the pug in your life with crocheted birthday cake hat, have a look at PugsnGiggles’ Etsy shop here. Nick! What’s my one rule? Do not steal your yarn. Do not steal my yarn man. My one thing. 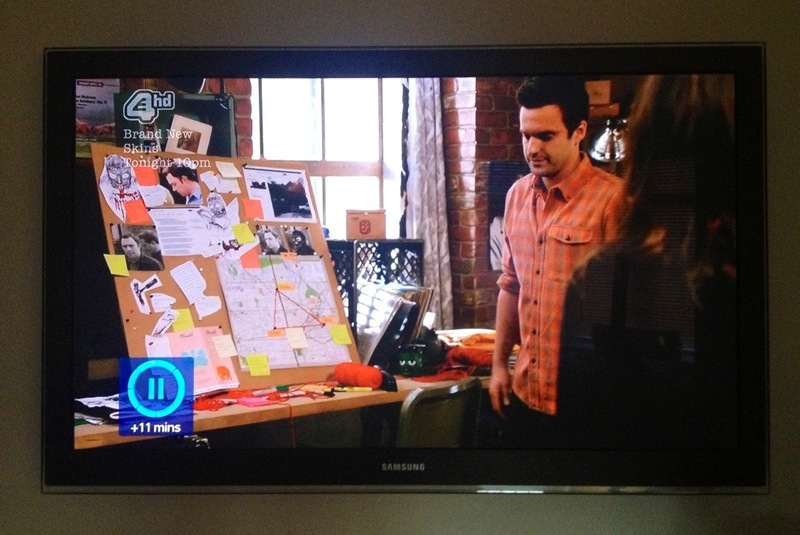 On the 11th October Anita left me a comment saying that she had spotted a crochet throw on The Guardian, Season 2, Episode 10. I just had to investigate. The episode’s name is “Sacrifice” and the crochet blanket is to die for!!! 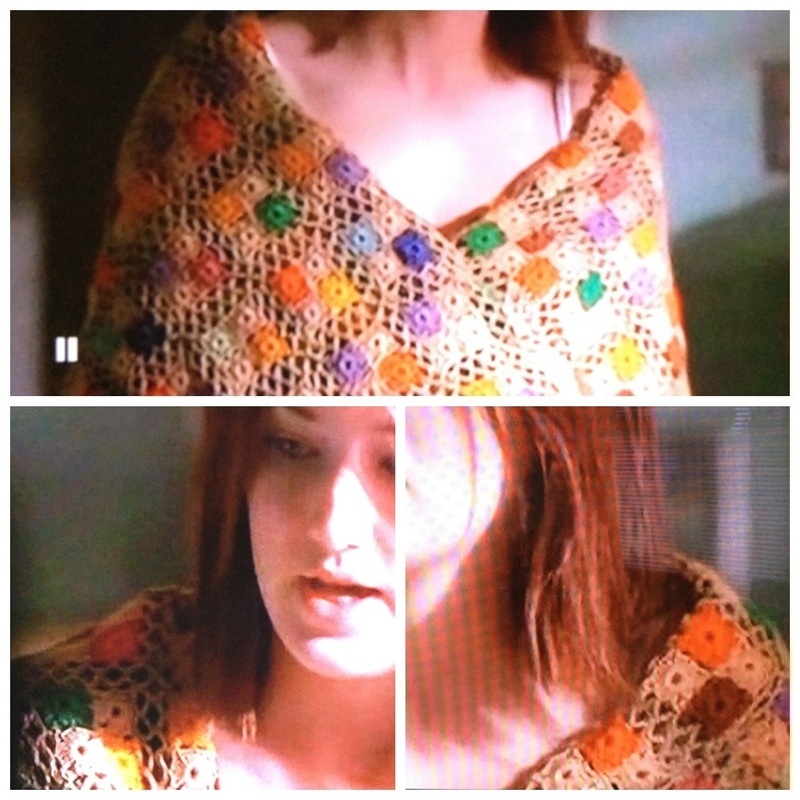 Betsy, played by Ashley Johnson, wraps herself in the crochet throw. Sorry Ashely, but the throw steals the show big time! You join your the four tiny squares together with this method to make one big square. Then, join the big squares together with this zig zag scallop join method. It’s not exactly the same as the throw in the show, but it’s as close as I could find and it will give you the same effect. To get the same colour effect, make sure you use one colour for two of the tiny squares in each big square as well as for your scallop join. This will be your main colour. If you do it this way, the other colours you chose for your tiny squares will stand out and give a visual rhythm to the throw. Now that I think about it, this design can be used for scarves, throws, cushions and even sweaters….. I’m off to Ravelry to add yet another project to my queue.